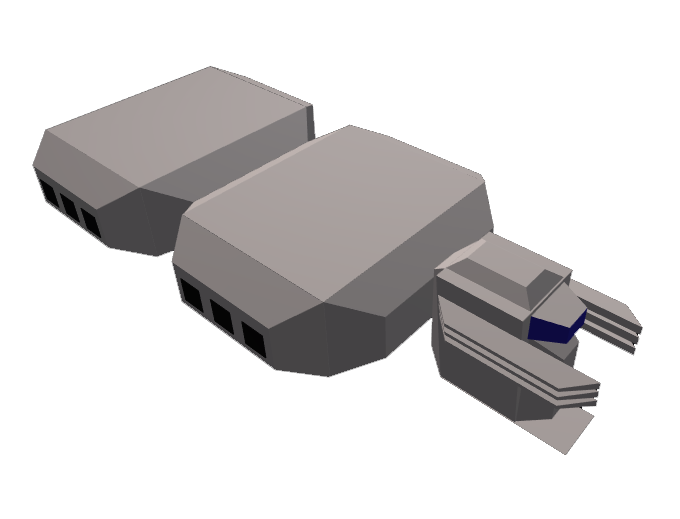 Here’s the latest iteration of Hauler. I worked on it all frickin’ weekend. Overhauled combat system. Still needs lots of work, but it’s a lot more fun than it was. Character avatars for the pirates. Nothing for the player to choose yet, however. One-letter-at-a-time text with nifty sound. The combat screen now has two modes – an “action” mode where you see the ships, lasers, explosions, etc. and then “dialog” mode, where it shows the pirate’s avatar a bit larger and they say stuff. I got the ships and some temporary explosions, but no lasers yet. I’m looking at some open-source Flash building tools to do the animations for lasers and explosions. I used Second Life to build the ship models and character avatars. As I’ve said before, I can’t draw, but I can bodge up models in SL pretty quick. I just took some snapshots of the models/avatars and applied a Mosaic filter to get them all pixely. Turned out pretty nice if I do say so myself. Juggernaut - huge and bristling with guns! The large cargo ship and Juggernaut are not yet seen in the game. One of my next steps is to add the ability for the player to purchase new ships. I also need to develop a system that pits you against pirate ships of similar firepower/size. I was having a dickens of a time trying to debug a sequence wherein the player loses a battle. At the end of the fight, the pirate talks some smack, then it shows the player (eventually I hope to have a dejected-looking expression on the avatars) and explains the consequences of their defeat. During that change from pirate dialog to player dialog, it kept locking up. I have a new rule when developing in Flex, and it serves me well: Whenever you spend more than 10 minutes trying to debug a weird problem in Flex, it’s probably a creation timing issue. Turns out that’s exactly what it was. I was wiping out the character component’s text box before printing new dialog, and since the component wasn’t finished building itself on the screen yet it freaked out. I solved it by wrapping the function call with a callLater( ) and bam…works great.